The B2B industry is undergoing a seismic shift as competition heats up and digital takes over. Content has emerged as a pivotal differentiator across B2B organizations and brands are recognizing its direct tie to business success. 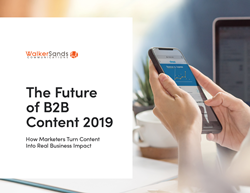 In fact, released today by Walker Sands, “The Future of B2B Content 2019” report reveals that nearly all B2B brands (98 percent) recognize that content’s performance justifies its cost. To better understand the role content plays in B2B business success, Walker Sands, an integrated PR and digital marketing agency for B2B technology and professional services companies, surveyed 300 B2B marketers with active roles in their companies’ current content programs. “The Future of B2B Content 2019” report found that B2B marketers are focused on investments in short-form content channels to drive leads, increasingly reliant on external content partnerships and in need of greater collaboration across stakeholders for content strategy. The report also uncovered the growing role video/multimedia content plays in the B2B content arena. B2B marketers expect content to generate new business: B2B brands’ top goals when producing content include boosting sales/converting customers (29 percent), building relationships with new customers (19 percent) and increasing brand awareness (18 percent). Short-form content currently rules the roost: The greatest number of B2B organizations plan to produce more social (72 percent), website content (65 percent), video (63 percent) and blog posts (49 percent) in the next 12 months. Buyers want more video/multimedia content: Sixty-nine percent of B2B marketers believe their target audiences will prefer video/multimedia content over written content in the next 12 months. External content partnerships are standard: Nearly all B2B marketers (95 percent) say it’s a priority to work with external agencies for content strategy/production in the next 12 months. Forty percent say it’s a high priority. To download the full Future of B2B Content 2019 report, click here. Walker Sands is a public relations and digital marketing agency for business-to-business technology companies. With an integrated approach to creative services, Walker Sands helps clients build brand awareness, enhance credibility and drive new business. Walker Sands is a six-time Inc. 5000 honoree and regular recipient of some of the industry’s most prestigious awards from organizations including Entrepreneur, Holmes Report and Hermes Creative. Walker Sands was founded in 2001 and has offices in Chicago, San Francisco and Seattle. To learn more, visit http://www.walkersands.com or http://www.walkersandsdigital.com.